Jesus lies prostrate, as if sleeping and difficult to rouse. His head rests on his arm and his eyes are closed. 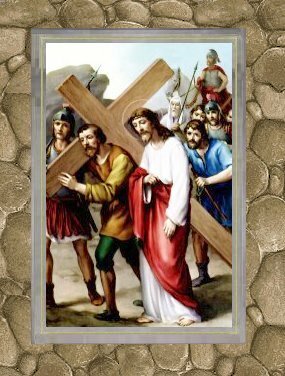 In the ninth station, he has completely surrendered to the forces about him. Having come through the vast ocean/desert of death in the seventh station, glimpsing eternity in the eighth, something has ended here at his final fall. Nine is the number of completion, the pinnacle of understanding, self-actualization. It is a total becoming and an utter undoing in a single effort. No longer concerned, or even aware of circumstances around him, Jesus is at peace. The Pharisee in the background points toward the next station. It might be coincidental that his folded arms reveal an index finger pointing eastward. It might not. I noticed it, and I think Spirit intended me to notice. I also noticed that the Roman numeral IX shows the ‘I’ or the self on the verge of transcendance, or X. The pilgrim has reached a crossroads, an intersection of spirit and matter, of life and death, a point where there is not either/or, but all. This station arrives back at the throat chakra, where we allow and receive God’s blessings. This requires passivity and the surrendering of doubt. If we can empty the vessel of fear, then Spirit can fill it with peace. You are currently browsing the archives for the throat chakra category.